It was a great day of tennis on semifinal Saturday in Atlanta as John Isner setup what promises to be a great final against Marcos Baghdatis. Both players had to battle for wins, and look to be in excellent form going into the championship singles match. Isner took part in the first semifinal against Denis Kudla, a match he won 4-6 6-2 7-5. Kudla’s career best form was on display in the early going as Isner was under pressure on his serve in both the 2-2 game and the 3-3 game. Isner fended off a break point for 3-2, but Kudla broke him on his third break point chance for a 4-3 lead in the opening set. The American baseliner was hitting the ball with aggressive flat power off of both wings and coming forward, making Isner stumble about on his footwork, and taking the match to Isner, which was the key. Kudla would serve out the set after fending off a break point, but getting that first break point chance seemed to energize Isner, who began to mix up his style a bit and bother Kudla on serve more. Kudla was hampered by a tense, and at times weak serve, and the second set was all Isner. The big man was bombing aces, and scored a double break for a 6-2 second set, the final break game also giving Isner the benefit of serving first in the third set, meaning the pressure was always going to be on Kudla every time he stepped up to the service line. In the third both players battled admirably, but Kudla simply failed to generate chances on the Isner serve like he did in the first set, holds were easily had, but Kudla had to fend off a break point in a long game at 3-4, as Isner was looking for a chance to serve out the match. It would eventually go to 6-5 Isner, and then Kudla simply got tight, as he had to save a break point/match point, and then promptly double faulted to setup Isner with another. This time Kudla’s return was sent long and that was the match as Isner continues to dominate the BB&T Atlanta Open. Stats wise, Isner fired 25 aces, Kudla had 4 double faults. and Isner won a remarkable 89% of his first serve points, that proving to be the difference. Kudla fought hard and deserves to be commended for his amazing recent run of form, and another career best result in reaching this ATP semifinal as a qualifier. He may not be quite up to the level of a top 20 player like Isner yet, but this match and his results in Atlanta show he’s on the rise and he can get to that level. It will be interesting to see what Kudla brings to the table for the rest of the Emirates Airlines US Open Series, which next goes to his home tournament in Washington D.C., the Citi Open. 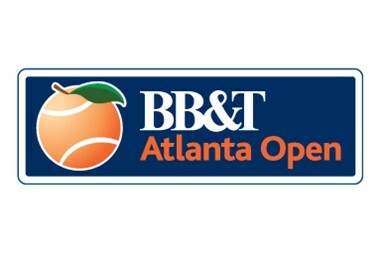 In the second singles semifinal veterans Marcos Baghdatis and Gilles Muller were both seeking to reach their first ATP final in over three years, and Muller was bidding to reach his second BB&T Atlanta Open final, however Baghdatis prevailed in a close match 6-7(4) 6-3 7-6(4). Muller served first against Baghdatis, and as expected was firing aces or unreturnable serves right off the bat. He didn’t return as well as he had in his previous wins, but Baghdatis was a step above his other opponents in terms of level as they battled to 5-4 Muller. In the 5-4 game Muller had a 0-30 lead, but he didn’t advance any further than that as Baghdatis fended him off and from there the opening set went to a tiebreak. Powered by 9 of his 15 aces coming in the first set, a couple of good return points Muller took that tiebreak 7-4, as he was 5-2 and 6-4 up in the breaker, while Baghdatis never had a lead. In the second set, Muller’s serve began to dip in quality a bit, and the ballstriker Baghdatis pounced with talented shotmaking. Marcos broke for 2-0, then saved a break point in the next game for a 3-0 lead. He would have another break point chance at 4-1, but Muller scratched through the game. The Cypriot didn’t face any sort of pressure on his own serve after the third game of the set and served the match into a third set with relative ease 6-3. The third set surprisingly featured breaks for both players as Baghdatis took a 2-1 and 4-2 lead, and had a break point for a 5-2 lead. However Muller continued to hang on though his serve was clearly letting him down. The Luxembourger broke back for 4-4 with surprising efficiency and then held for a 5-4 lead, meaning the pressure would be on Baghdatis the rest of the way. Marcos rose up and broke in a very long 5-5 game, but then failed to serve the match out, as he got tight under pressure, something he also did in the quarterfinals against Pospisil, as his level has dropped in tense moments this week. In that breaker Baghdatis won the first point, and then held serve from there to take it 7-4.The Cypriot also earned the win in the stats column, as Muller won just 50% of his second serve points (compared to 66% for Baghdatis). It was a close match, but Baghdatis had a more well rounded game, and was better able to deal with adversity compared to Muller’s more one dimensional style. On key points Muller’s shot selection was also lacking. It’s been a fantastic week for a passionate and motivated Baghdatis, he seems fitter than he’s been in years, and he’s shown glimpses of the form that once made him a Grand Slam finalist nearly a decade ago. Regardless of the outcome of the final, he has a chance to make noise the rest of the hard court summer, and also in the US Open as he remains one of the games best offensive baseliners, and a true talented shotmaker with good groundstrokes and a solid serve. Isner will be a heavy favorite in the 2015 singles final, not only has he won the last two BB&T Atlanta Open’s, his serve has been on point this week and he has yet to lose a tiebreak (3-0). On top of that he’s 5-0 in his career against Baghdatis and all of those wins came on outdoor hard courts, the most memorable being their 2011 US Open Round 1 meeting that saw Isner win two tiebreaks and advance in four sets. Their last meeting came in 2013 in the DC quarterfinals and Isner won that one in three sets, though he lost a tiebreak. The match against Kudla was Isner’s toughest of the week however, and Kudla is in some ways a poor man’s Baghdatis, as they both have powerful ground strokes and try to play aggressively, while Baghdatis has a better serve. Marcos has had to win four singles matches this week as he didn’t get a bye, so fatigue could play a factor though he seems fit, as the match will be played in hot afternoon conditions. The key factor to me is the fact Baghdatis has gotten tight when facing the pressure of closing out opponents, and his struggles to do that against Pospisil and Muller should dent his chances. However, he did beat the big serving Groth, and Muller in three sets, so he’s already beaten two of the best servers on the ATP tour in the same week, on the same court, and Isner is right up there with them. We could be looking at three sets, but with the h2h and his current form all helping him out, it’s hard to see Isner not winning a third Atlanta title. Gilles Muller needed the literal definition of suitable rest after his grueling three set semifinal in singles, and surprisingly he did reach one final this week, that coming in doubles as he and his partner Colin Fleming beat Eric Butorac/Artem Sitak 6-3 5-7 10-3. Muller/Fleming got off to a strong start in the first set going up 3-0, and though there were a lot of break point chances on all sides in the first set, they got the key break and served out the first set. In the second Muller/Fleming faced four break point/set points serving 4-5 down after routine holds in the second, and though they survived that, Butorac/Sitak break for 7-5 after not facing a break point chance in the second set. The super tiebreak was then dominated by Muller/Fleming as they went from 1-1 to 6-1 and from 6-2 to 9-2 rather quickly. This team featuring a doubles specialist and a big server will prove to be an interesting foil in the final to the Bryan Brothers. The aforementioned world #1 team ended the surprising run of Chris Eubanks/Donald Young 6-2 6-4 in a dominant showing that only lasted 49 minutes. The Bryan’s have simply looked to be a cut above this tournament and haven’t really felt the heat this week, as a result, they should be strong favorites to add yet another trophy to their storage locker sized career haul on Sunday, as they vie for their first BB&T Atlanta Open final. The doubles final comes first and then the singles in the final day of tournament action from Atlanta in what has been yet another successful edition of the Atlanta Open. The talk of Australian sports this week has to be Bernard Tomic, who captured his first career ATP title 6-3 6-7 6-3 over Kevin Anderson. Tomic was able to fend off the South African’s big serve and forehand, along with moving well and mixing up his shots enough to frustrate Anderson’s attempts at being aggressive, while holding his own serve without tremendous difficulty. To set the tone for the match he broke to start off the first set, then traded holds the rest of the way, traded holds again in the second set only to lose the eventual tiebreak, but then broke again in the third to seal the match. In previous rounds the 20 year old Aussie beat countryman Marinko Matosevic, Florian Mayer, defending champ Jarkko Nieminen in 3 sets, and Andreas Seppi in the semis. Against Seppi, Tomic struggled with the scorching hot daytime conditions and repeatedly looked like he was ill. At the end of the 1st set he was even dealing with dizziness, but he fought through and came up with some tremendous shotmaking for a 7-6 6-4 win. Anderson will be pleased with his run to the finals in which he beat Aljaz Bedene in 3 sets, Feliciano Lopez and Denis Istomin in straights. He followed that up by coming from a set down to beat Julien Benneteau in the semis. He seems rejuvenated in the early part of 2012. In the doubles, the Bryan Brothers won yet another doubles title in preparation for the AO beating Max Mirnyi and Horia Tecau. Lleyton Hewitt took the title in the exhibition Kooyong classic just outside of Melbourne with a surprising win over Juan Martin Del Potro 6-1 6-4 in the final. The tournament was beset by withdraws and in and out participation by various players, but still featured some enjoyable tennis. Hewitt notched wins over Milos Raonic and Tomas Berdych earlier in the week, while Del Potro beat Paul-Henri Mathieu and Marcos Baghdatis. They might as well make David Ferrer an honorary Kiwi , as he claimed his fourth Auckland title 7-6 6-1 over Phillip Kohlschreiber, who also continued his streak of quality play in Auckland. Ferrer and Kohlschreiber traded breaks in the opening set and Kohlschreiber even had some set points, but he could not convert them and Ferrer fought his way to a tiebreak and edged it out. In the second set, the level of play dropped precipitously on the part of Kohlschreiber and Ferrer raced out to the easy straight set win. Previously, Ferrer beat Yen-Hsun Lu in 3 sets, Lukas Lacko in straights and demolished a gimpy Gael Monfils 6-1 6-2 to make the final. Kohlschreiber worked his way through Alejandro Falla, Xaiver Malisse and Sam Querrey. In the doubles, it was an emotional moment for Colin Fleming as he took the title with his temporary partner Bruno Soares, 7-6 7-6, over John Brunstrom and Freddie Nielsen. Fleming’s usual doubles partner Ross Hutchins announced earlier this month that he was diagnosed with Hodgkin’s lymphoma during the offseason and is undergoing treatment. The tennis world has responded in support, with Andy Murray dedicating his Brisbane win to Ross, and Fleming and Soares doing the same. Here at Tennis East Coast, we also want to do the same. We’re wishing Ross, one of the nicest guys around, the best of luck and all the support we can give as he battles cancer. Like many of you, I had the pleasure of meeting him in Atlanta along with Colin. We can’t wait to see him return the courts and start winning matches again, serving as an inspiration to us all.